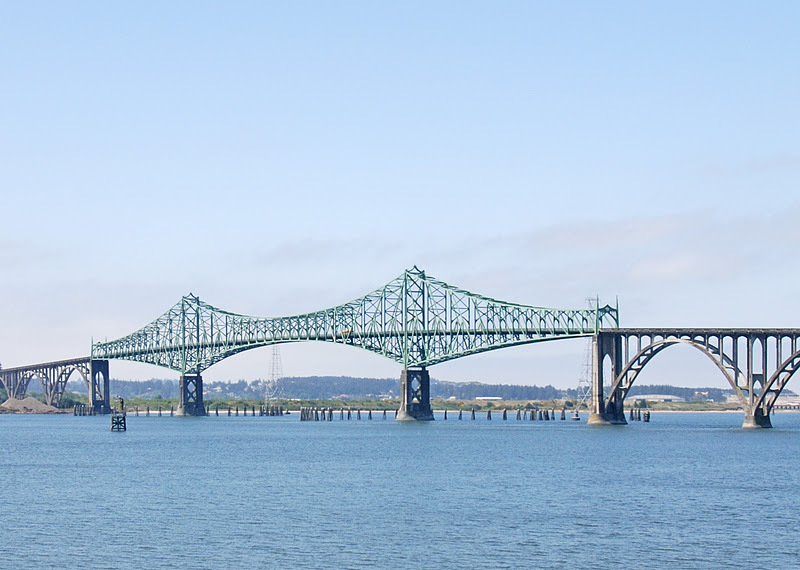 As we continue our study of bridges along Oregon's coast, we come to the Coos Bay Bridge twenty miles south of the Umpqua River Bridge. It's amazing that the state of Oregon was able to build five long span bridges along it's coast in a single year and build a highway between California and Washington State in about a decade. In one fell swoop, people were able to drive along the coast from San Francisco to Seattle. I wonder how the money, material, and labor became available to get so many handsome bridges built in such a short time? The Coos Bay Bridge (also called the McCullough Memorial Bridge) is a steel, cantilever truss bridge with a 793 ft main span, 458 ft long side spans, and thirteen reinforced concrete arch approach spans for a total length of 5305 ft. The steel truss segment was designed with curved top and bottom chords to match the arches of the concrete approach spans. It was the largest of the five bridges built as part of the Oregon Coast Bridges Project and cost slightly over $2 million in 1936. Oregon's Bridges: Coos Bay Bridge by Mark Yashinsky is licensed under a Creative Commons Attribution-NonCommercial-ShareAlike 3.0 United States License.